Today as the Babywise Friendly Blog Network ladies all talk about something around the them “lunches,” I thought I would talk about organizing school lunches. I have talked to other moms and I know I am not alone in feeling stress over making lunches to send with my children to school. One of the most liberating things about summer is not having to make a lunch each morning! But school starts again all too soon, and with it will come the need for lunch. I don’t love the way schools are forced to make lunch these days (whole other topic), so I don’t mind that my children don’t like much of what is served at school. But I am not going to lie; I rejoice on those 4 days of the month Brayden will eat what the school is serving! Any time something causes me stress, I try to make it less stressful in life. I am not the stressing type. I am the organizing type. So I have been thinking about how to make this easier, especially because up to this point, it has been stressful with just one child. Kaitlyn will be at school full-day this year and thus having lunch at school, too. I have very much learned if it was hard with one, it is harder with two (and so forth). 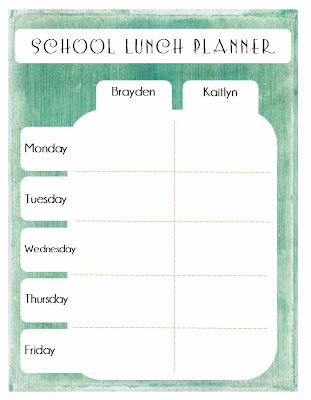 Go into the week knowing which days your child will eat a home lunch and which days your child will eat a school lunch. If you want some variety, writing down ideas ahead of time can help you make sure you have supplies on hand and help you that day to think less and act more. And in true “me” fashion, I made a printable! 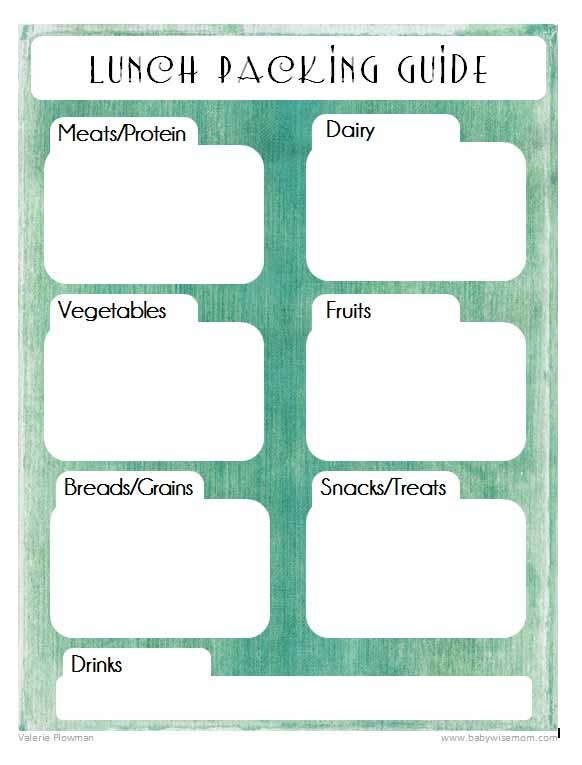 (I told my husband I had been thinking about organizing school lunches and he said, “let me guess; you made a printable so we can write down school lunches?’ to which I essentially replied, “yes I did. Aren’t I awesome.”). And I am the sharing type, so I made two versions for you. One has the title “School Lunch Planner” and one “Lunch Planner.” You can print it, laminate it (use a page protector instead if you don’t have a laminator), and write on it with dry erase, wet erase, or even permanent marker (use finger nail polish to remove it). Sometimes we get tired of the “same old same old.” If you need help with ideas, see my post with lots of ideas on what to pack in a lunch: “Sack” Lunch Ideas. Also, check out Pinterest (of course). You can see ideas on my “School Time” board. So obvious right? Have your child make what he can. I really vacillate on this. One one hand, I am a huge proponent of children being responsible for themselves and learning life skills. Being able to pack a lunch is pretty basic. On the other hand, eating lunch made by mom or dad when you are at school is like getting a little bit of love from home in the middle of the day, so I don’t really mind it making it when I think of it that way. For help making it, I made this sheet to the right. I have printed it, laminated it, and hung it inside the cupboard door where most of our school lunch supplies are kept. I am writing on it the things we currently have as options to get each food group. I want to make sure the kids pack a balanced meal, and I want them to know all of the options that we currently have. 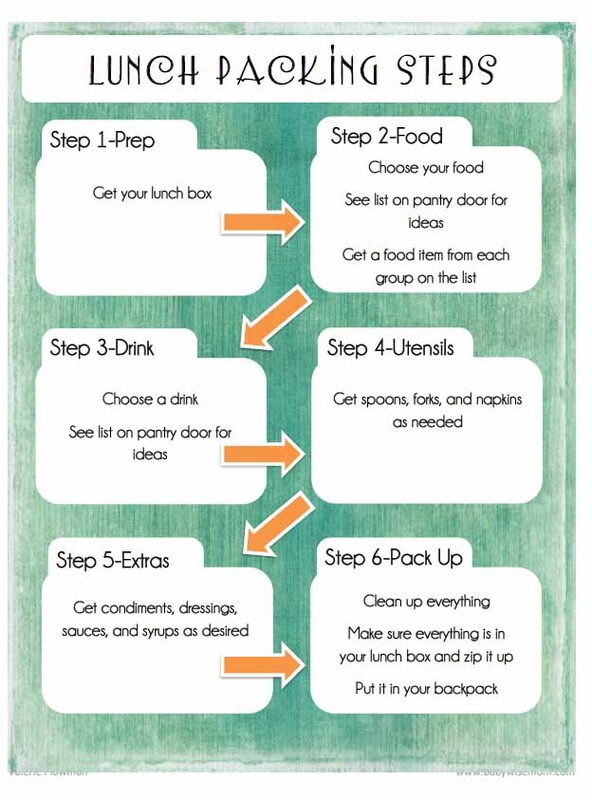 Here is a link to get your own: Lunch Packing Guide. And then I thought, this is great, but I can totally see them packing up the food and forgetting a fork or something. So I created a Lunch Packing Steps guide I can hang right above this. They won’t need it forever, but for as long as they need a reference, it will be there. I also made one that is blank in case you have different steps than I do. Pack what you can the night before. This can help reduce the stress as you are trying to get people out of the house on time in the morning. You can cut up cheese slices or group servings into reusable containers or baggies and put them in the fridge for you or your child to grab in the morning. Words of affirmation is one of the five love languages. Every so often, slip a note in your chld’s lunchbox telling him you love him, things you like about him, “hi,” and even jokes. A little bit of home. Today is our first day of our Babywise Friendly Blog Network Thursday Tried & True Tips & Tricks. Check out the other blogs in the BFBN for great lunch ideas today, visit our joint Pinterest board for more lunch ideas (check out especially Back to School board, Feeding Children board, and Feeding Babies board). Remember to enter the giveaway we have going to celebrate this new adventure. You can enter for a couple more days.